← How do you explain to a good dog why you can't give him a doggie goodie any more? 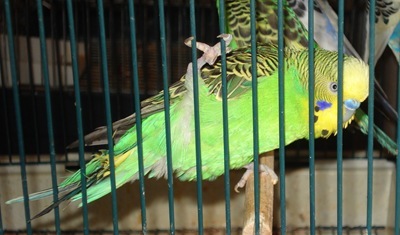 Several years ago two baby parakeets with hardly any feathers were left in a shoebox on the porch of a home of another parrot owner. These two babies had “splay leg”, a condition where they are always doing the splits. The parrot owner did not have time to raise them, and he brought the shoebox with the mostly naked babies to our local bird store. 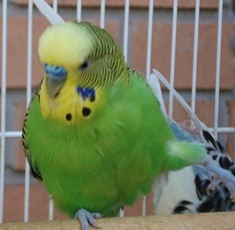 Later that day, in walks X.
I am well known at the bird store as a soft touch. 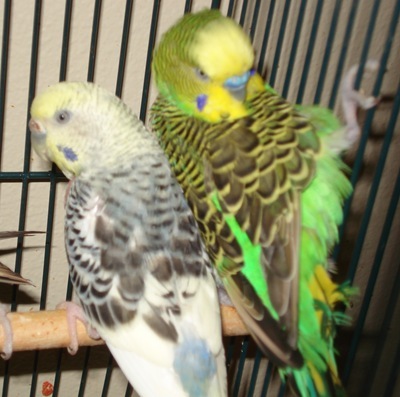 The manager of the bird store insisted I take these babies and give them a good home. It was not very difficult for him to convince me. I took these two mostly naked, handicapped babies home, named them Fred and Ginger, and started handfeeding them instant formula with a syringe several times a day. They grew up just fine. Freddie turned out to be a girl, and Ginger turned out to be a boy, by the way. 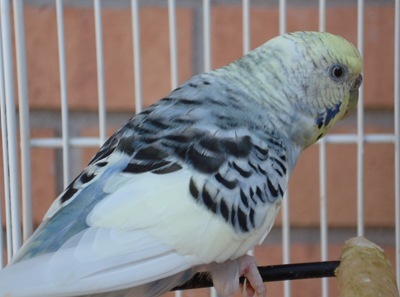 With parakeets, you never know what they are until they near adulthood and their cere, the area above the beak, turns blue for boys and pinky brown for girls. Anyway, Freddy, on the left in the picture of both of them, gets around pretty good. She can sit on a perch with a fairly wide stance, and looks mostly comfortable. 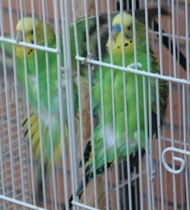 Ginger, in the picture above, right, however, does the splits so bad that he has to have one foot on the perch and one foot on the side of the cage. That is, until along came Moonpie. Moonpie was a lonely spinster parakeet who had never been in love. When Ginger grew up, Moonpie fell in love with him, and decided to help him, difficulties and all. Ginger and Moonpie rely on each other. They are a very sweet couple. They are most always together in one certain position. Since it is uncomfortable for Ginger to stand, Moonpie stands behind him, propping him up. The picture below is the best I can get, you can’t really see that Ginger is leaning on Moonpie, but he is. Ginger, being the man of the house and a good provider, feeds his bride. One of the cutest things that God ever came up with (in my humble opinion) is birds in love feeding each other. If you are not a bird lover, you might not think it is wonderful, but Ginger feeds Moonpie mouth to mouth, the same way that Mommy and Daddy birds feed babies. 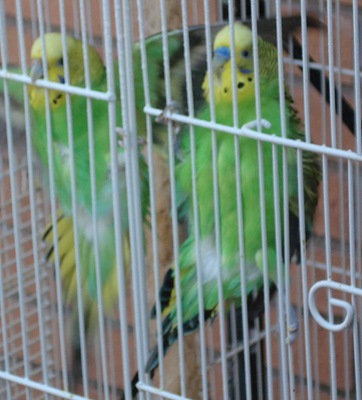 In my bird cage, as in real life, individuals with various problems get together to share the load together…. My hubby and I are having an anniversary soon. Our marriage has not been an easy road. There has been many hardships of various types, but, throughout all of it, we have loved each other and leaned on each other. We’ve propped each other up, and managed to get through all of the situations together.